Three cheers for the Goody Patch! 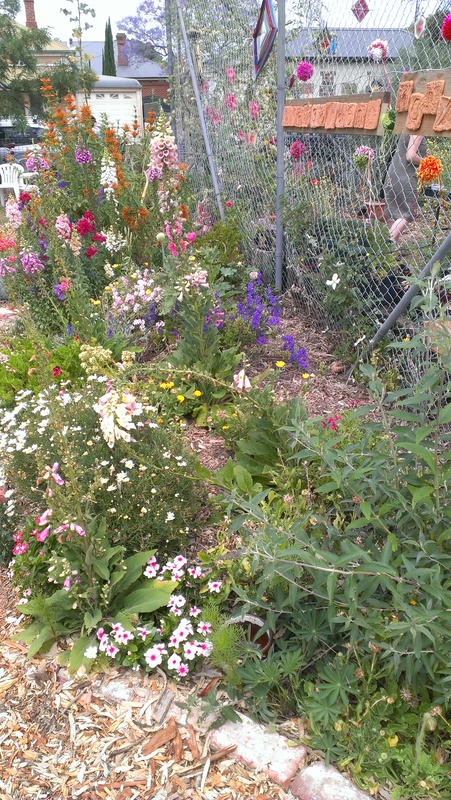 We have a wonderful local community garden (there are several locally, but this is the neighbourhood treasure). 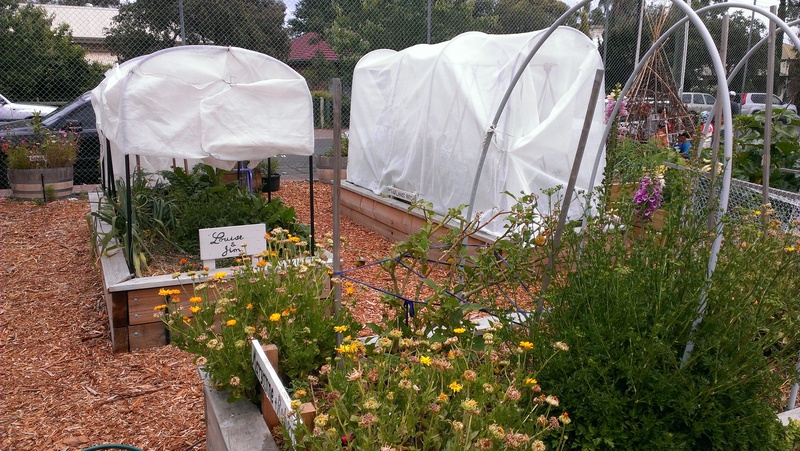 It’s called the Goody Patch–partly because it’s attached to the Goodwood Primary School and partly because it is a source of goodies (good things). Here’s the welcome mosaic. Recently it had a birthday party. 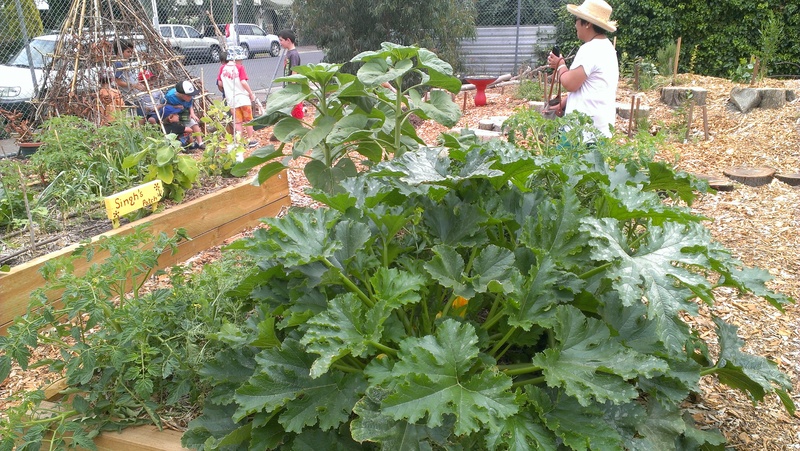 There were early zucchini (courgettes). 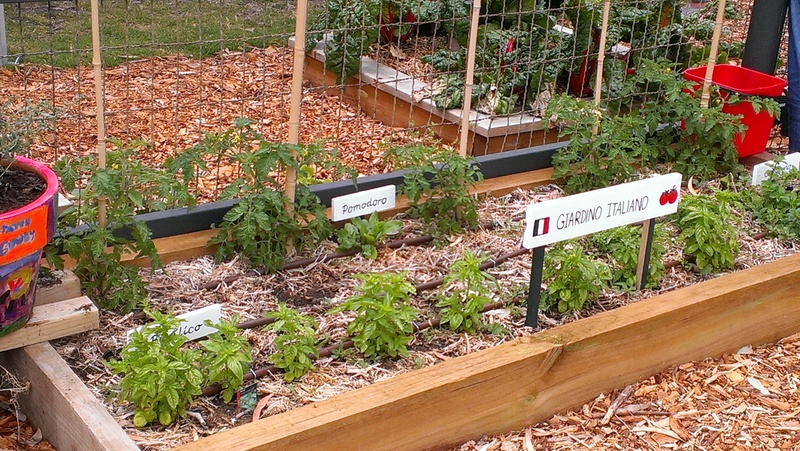 There were herbs, and beds celebrating the cuisines of particular communities. And all manner of gardening gloriousness, together with the odd bit of yarnbombing (look at the fence in the background below). It was a great celebration of this garden, which has gone from humble beginnings in a small area to its current much bigger size and range of activities. 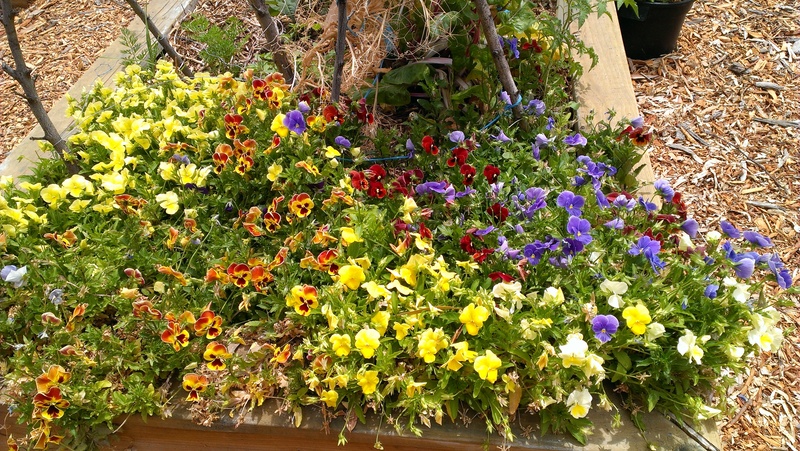 If I am able to go past during the schoolday, there are schoolchildren in there excitedly learning to propagate. On the weekend there are adults and children working together. There is always plenty to look at and admire. I went home munching on a chocolate chip and fresh mint biscuit (it was green and delicious) and carting a few additions to our garden from one of the many stalls. So here’s to a neighbourhood treasure and all those who initiated it and sustained it until, as one friend said, it reached a critical mass. 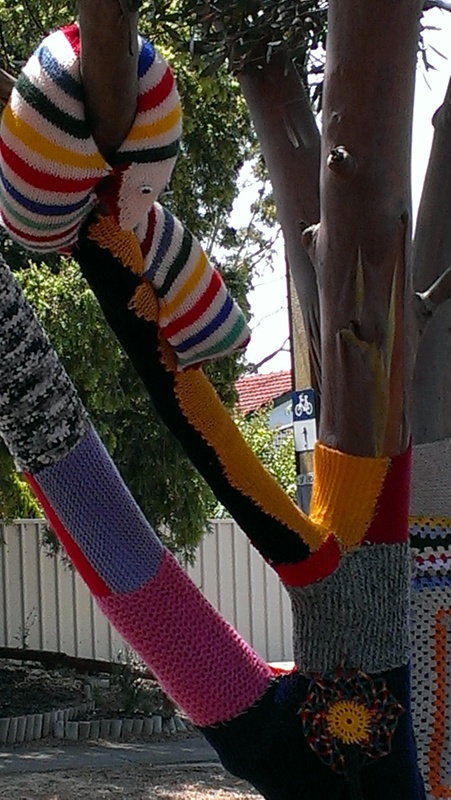 Yarn bombers hit Christie Downs! 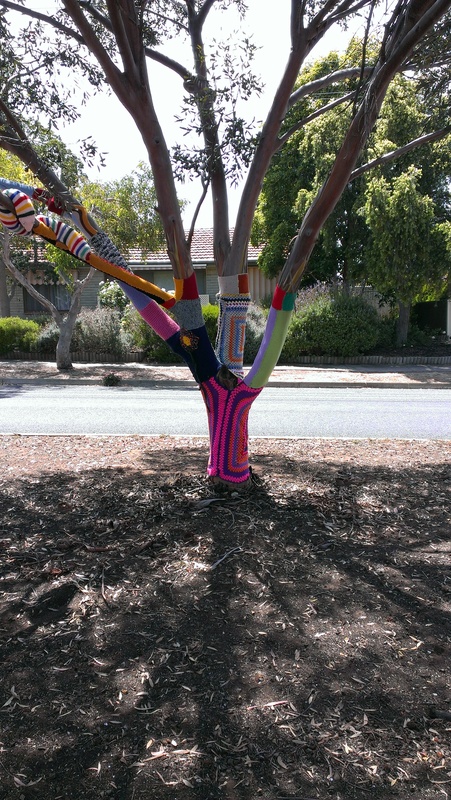 There are some great yarn bombs going on in Christie Downs right now. I had a tip from a friend! But they’re all pretty splendid, I reckon. 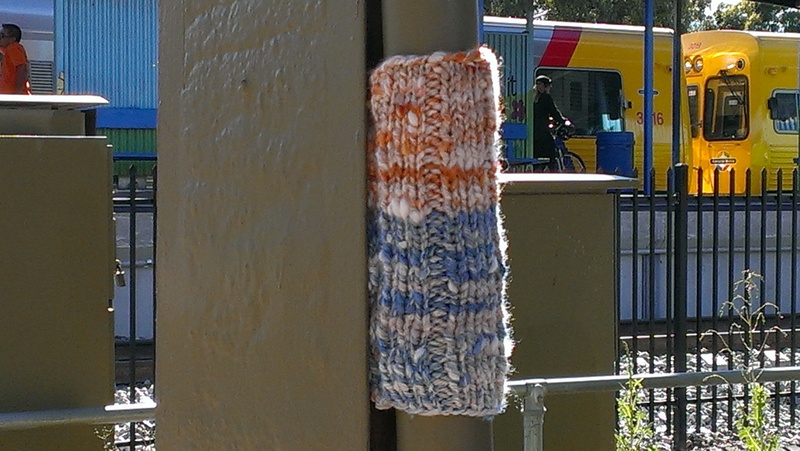 Evidently these yarn bombers have plans to yarn bomb the railway station, which could really use a little love… if you want to help out you’d be welcomed. 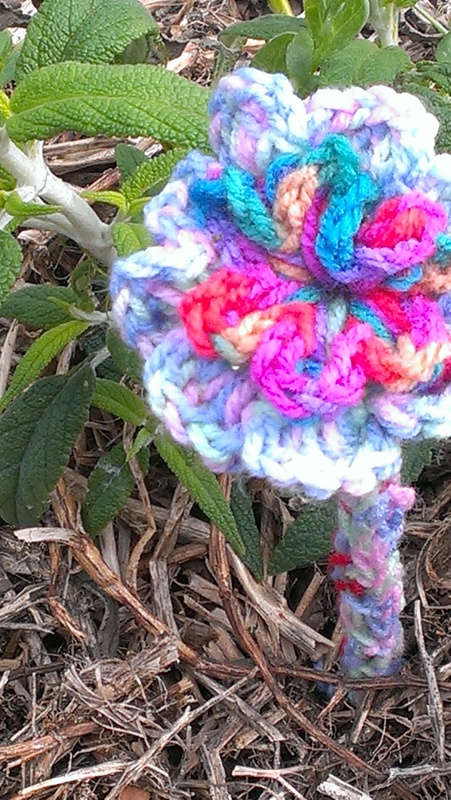 Some of the recent trash batt yarns and some other odds and ends have begun their life in the wider world as yarn bombs. I set out for a stroll with three swatches. This was the first to go up. 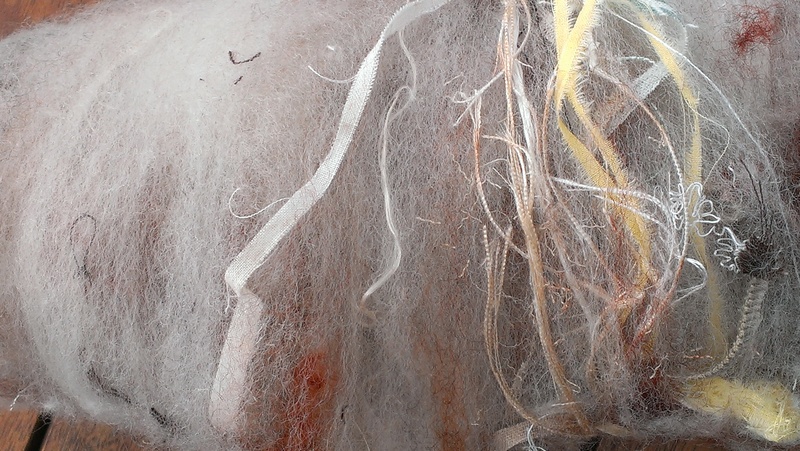 It’s an all trash batt–including overlocker waste. 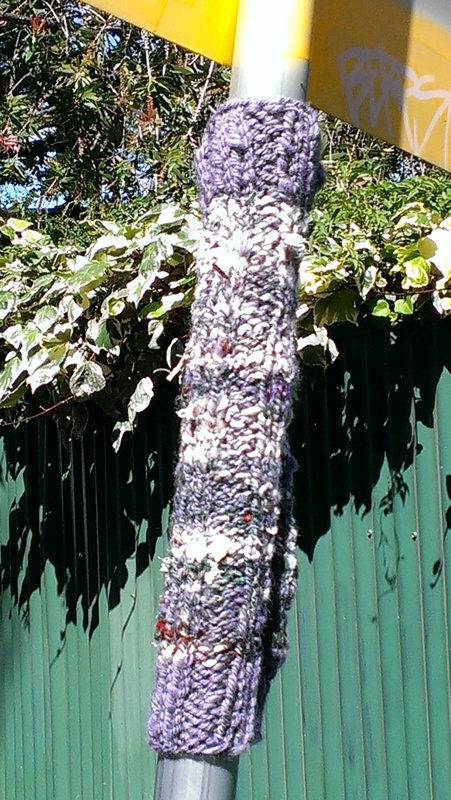 As I began to attach it to its wonky, leaning pole, a father rode past on his bike accompanied by a child, also on a bike. 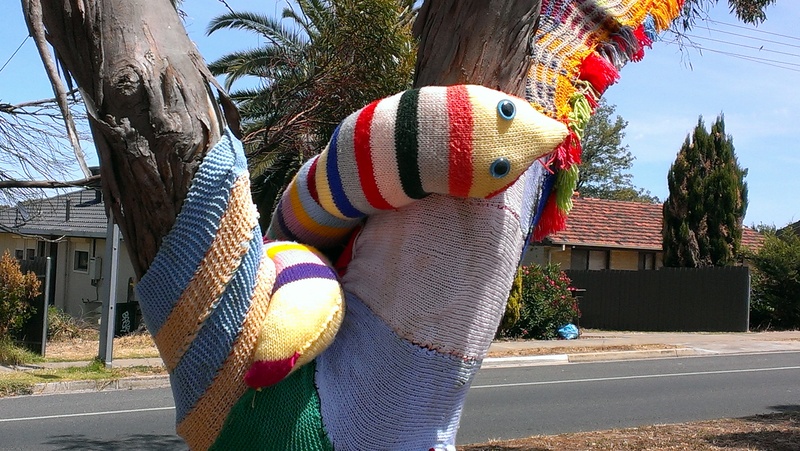 He called out to the child: ‘Look, there’s someone yarnbombing!’ and stopped to tell me about the best yarn bomb he ever saw (on Kangaroo Island). I admit, I had not expected to be the subject of instruction to small children. 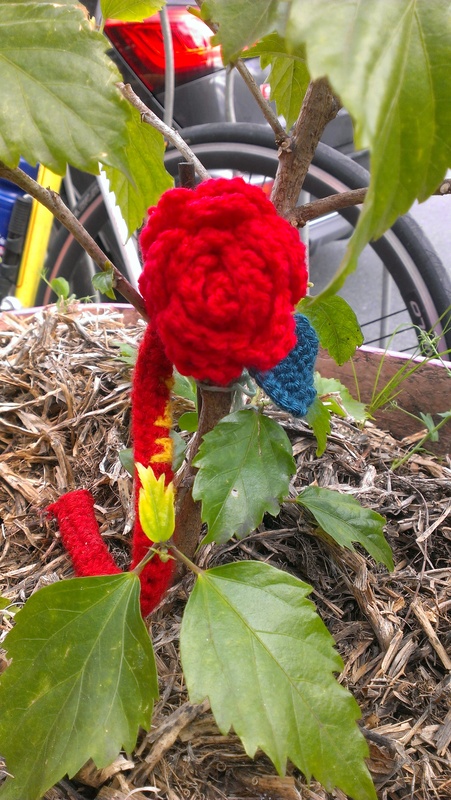 Since I was in my own neighbourhood, next came a friend who lives nearby, and then another (I introduced them) and there was speculation about the Viva La Broad Bean yarnbombers/guerilla gardeners and other yarnbombs in the vicinity. The Broad Beans were appreciated and complimented in their absence. This one has gone up on a pole which is topped by a mirror to allow visibility around a tricky corner. It turned out the tea cosy I made from this yarn contained all but the last few felted bits and bobs, so this is mostly a natural grey yarn bomb. 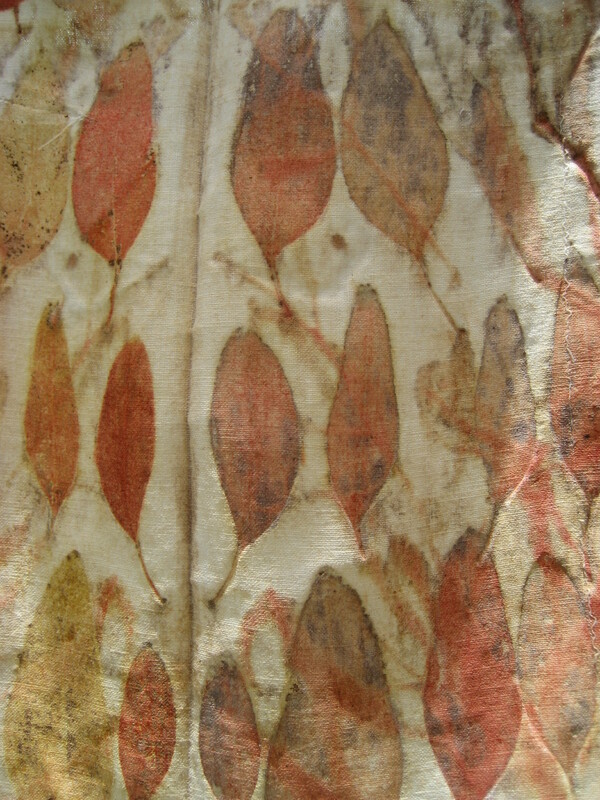 Yes, the stitching is going in two directions. 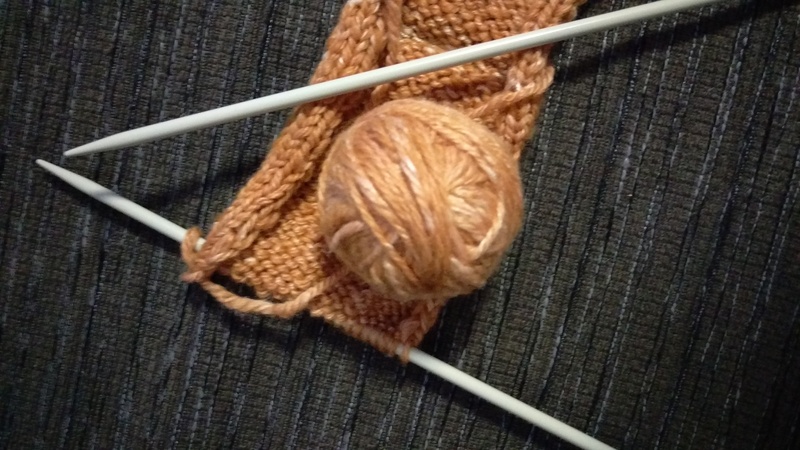 In a moment of whimsy I decided to pick up and knit the second half at ninety degrees to the first, partly so the felted parts wouldn’t all be along an edge. Finally, this is on one of the main access points for the local train station (yes, that is a suburban train in the background). This yucky greenish paint is the one preferred for public transport infrastructure and fencing in our area, and it could certainly use improvement. 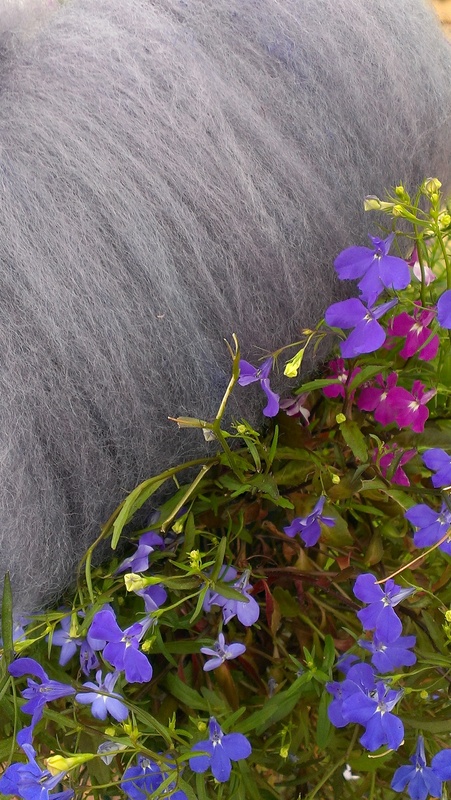 These colours are from coreopsis and indigo. I have placed these friendly emblems on either side of the Viva La Broad Beans’ guerilla garden and yarnbomb festival in hopes it will encourage the Broad Beans and contribute to the neighbourhood cheering up programme. 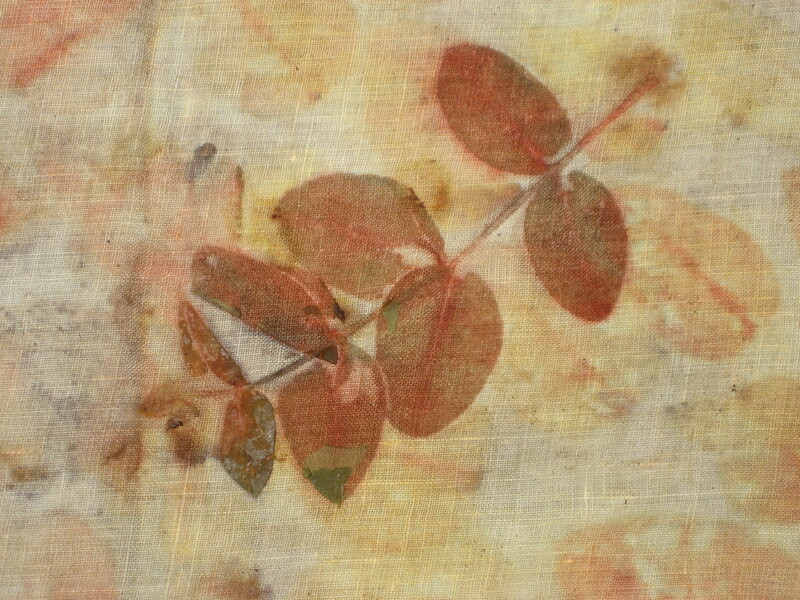 The evening I saw the Broad Beans’ handiwork for the first time, a neighbour engaged me in a painful, heartbroken conversation about all that has happened locally in the last year. 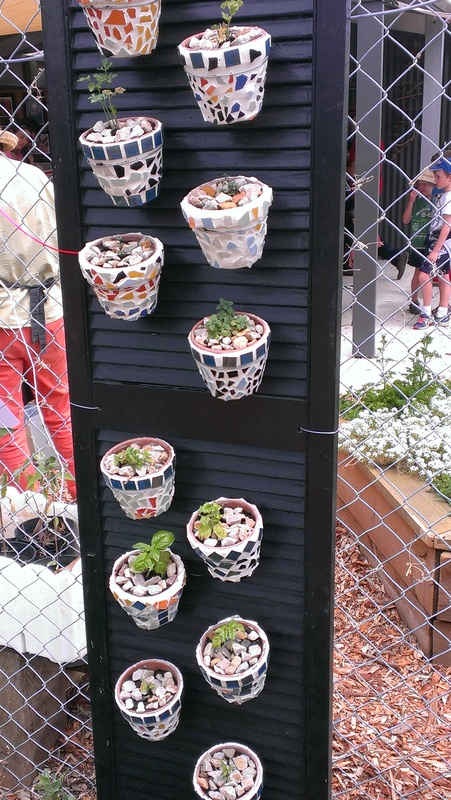 I took her to see the guerilla garden to cheer her up. 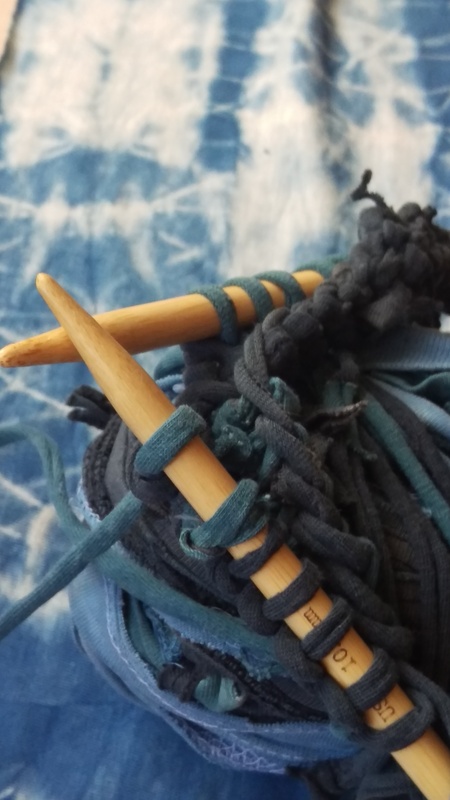 As I left home this time, and before I could apply crochet hook to pole, she chased me down the street and I had a long conversation with her about anger and grievances, loss and grief. 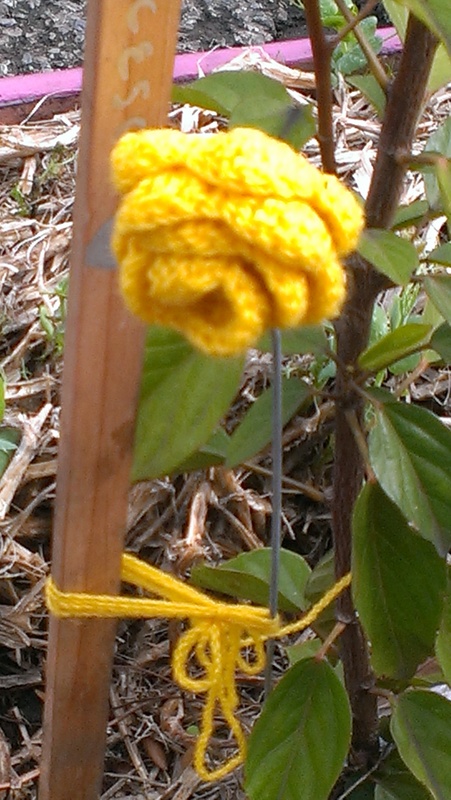 As one of the friends who came by and stayed to chat while I was applying knitting to pole said, there has been a lot to contend with and a lot to make people feel discouraged in our area over the last year. She said the Viva La Broad Beans’ handiwork had made her feel a whole lot better and uplifted her. I hope I can make a small contribution by their side. 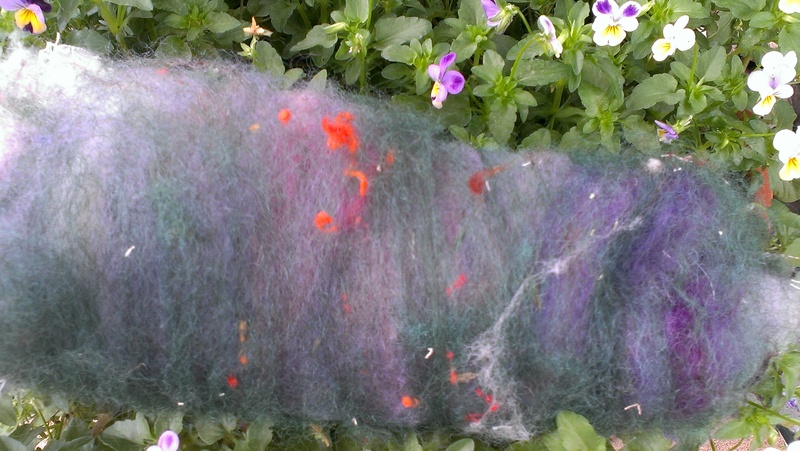 Experiments in diverting textile waste from the rubbish bin or compost continue… The lavender wool and the entirely waste batt are all spun up. 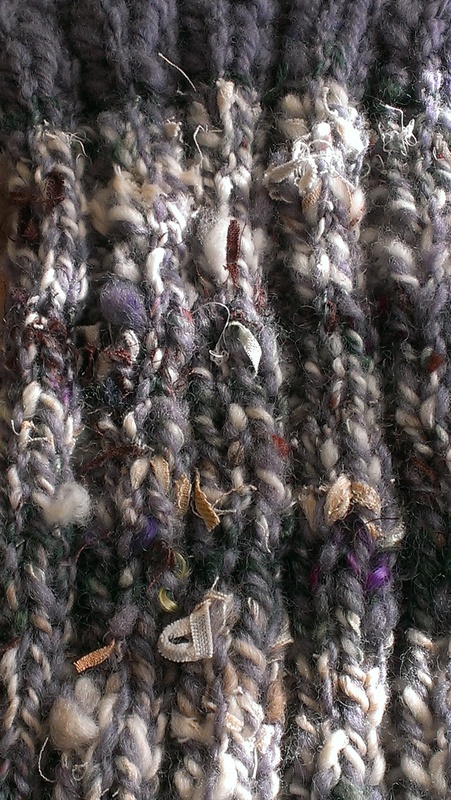 In the end, I plied the trash batt with a single of the lavender wool. I can’t say I expected loveliness, and to my mind this is not lovely. 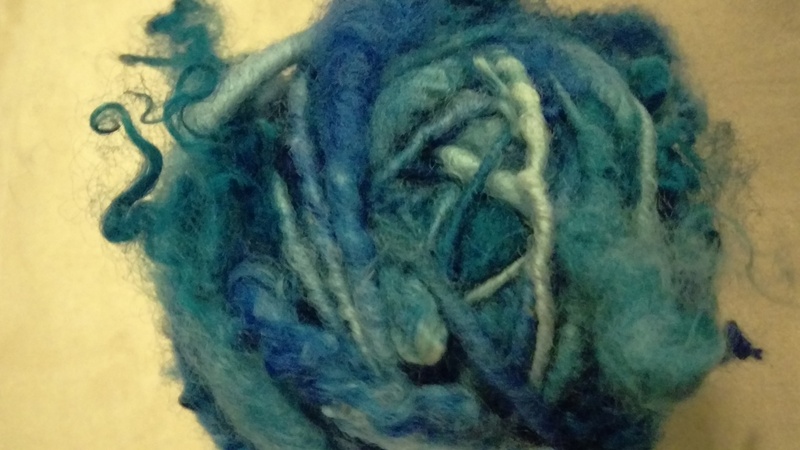 As for the spinning experience: it was fine to spin though my lack of foresight about a plying strategy wasn’t ideal and I didn’t think a chain 3 ply would work. 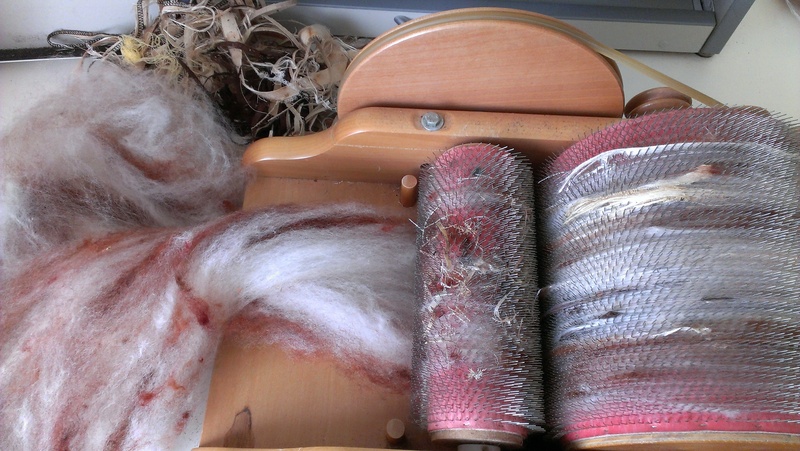 I also have to say that even with a generous apron under my drafting zone, this yarn shed loads of pieces of chopped thread at every stage, which didn’t make me popular with my beloved. 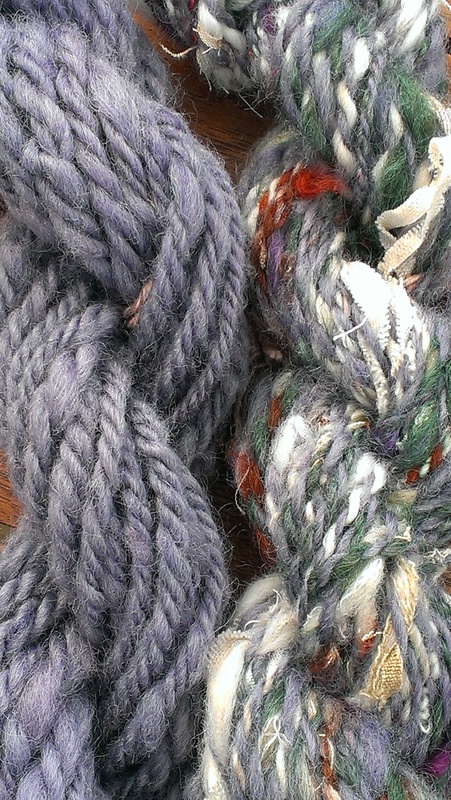 These yarns are destoned for yarnbomb glory. 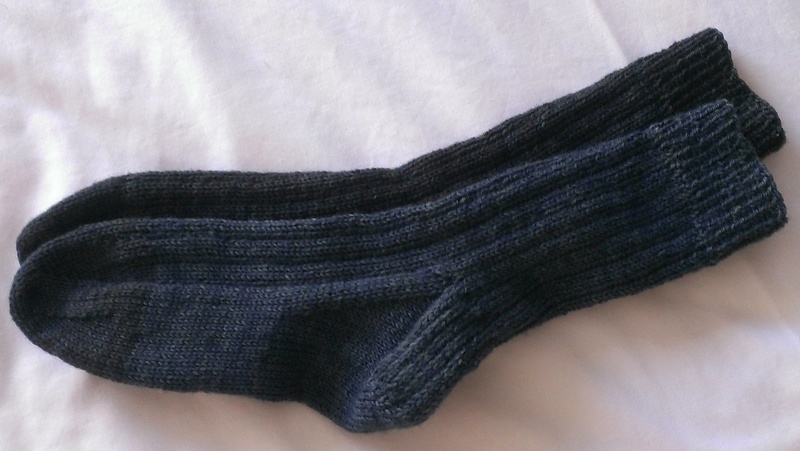 I knit then into K2P2 ribbing and will apply them when I’ve chosen a suitable spot and the rain and wind abate! 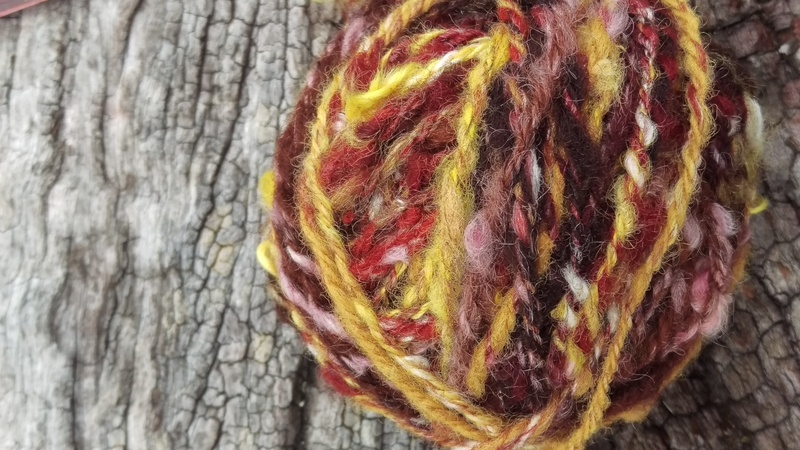 Some time ago I was kindly nominated for the WordPress family Blog Award by tinkerbellknits, who has a lovely blog you might like to visit. Thanks so much, tinkerbellknits! I am in turn nominating the following bloggers as people who have had a positive impact on my experience as a blogger… through their writing and what its shows about their craft and their values, their modelling of what a blog could be and what a blogger could be. I hope you might check out their blogs. My thanks to all those who have supported this blog–I started out quite unsure whether I would enjoy or persist with it, and I find that I do and I will. 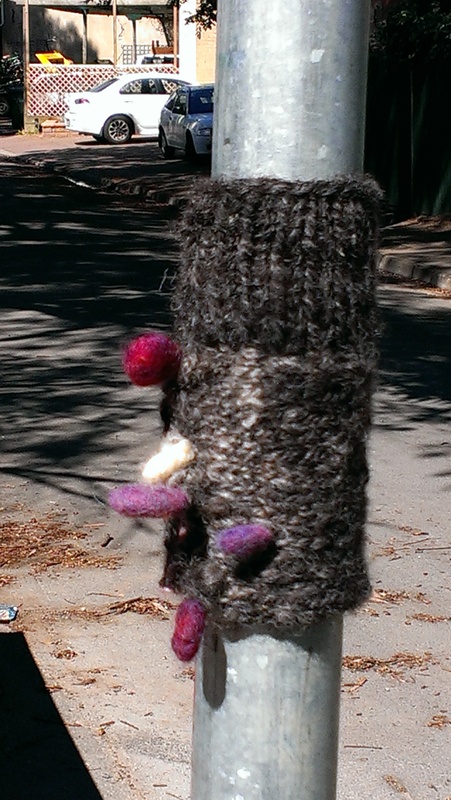 …and since we have been talking yarn bombs a little lately, here are some I added to the local bike path quite a while back. 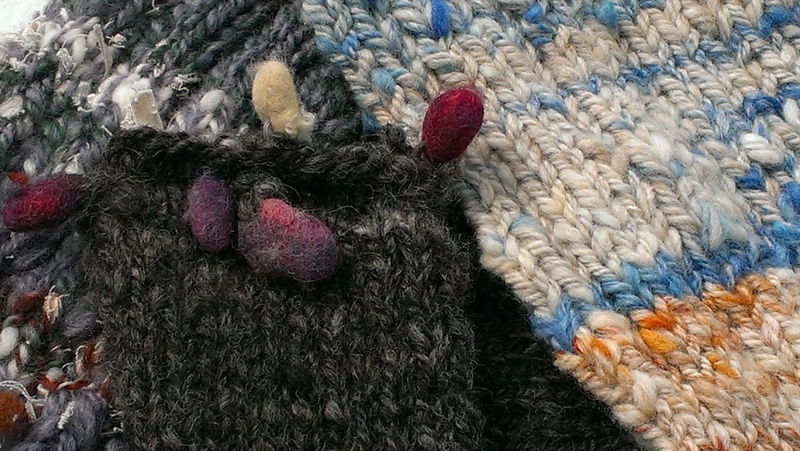 They are some of my early experiments in art yarn–some even made at a workshop with the inimitable Jacey Boggs (others made after poring over her book or DVDs). 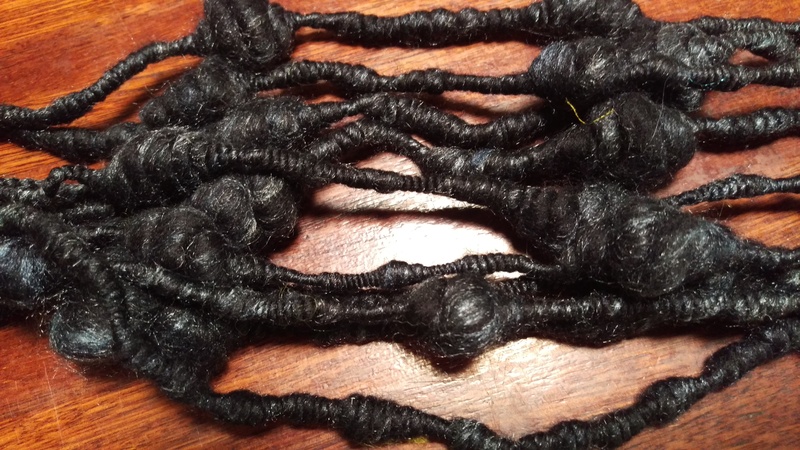 Cocoons, corespun, beehives and supercoils. 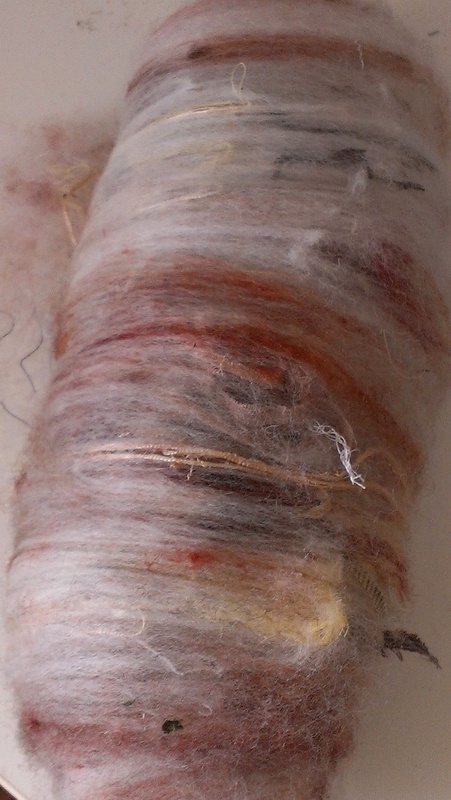 I have been wondering about trying some more spinning experiments with waste from the overlocker and the carding process. 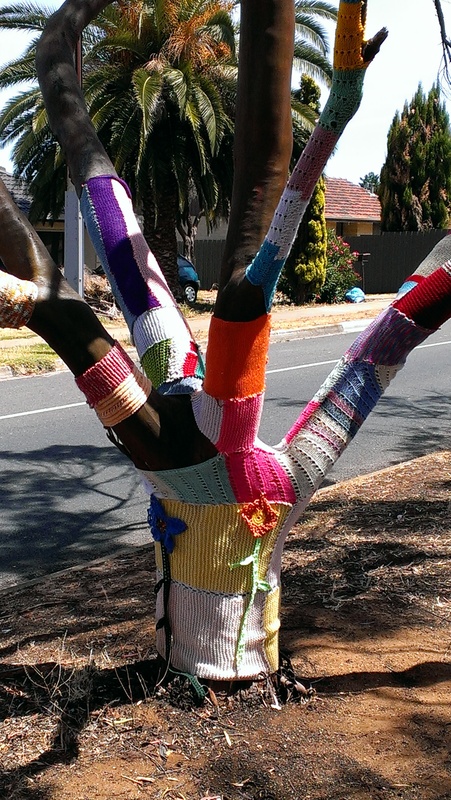 There is nothing like yarn bombing to make me consider any kind of yarn useable! 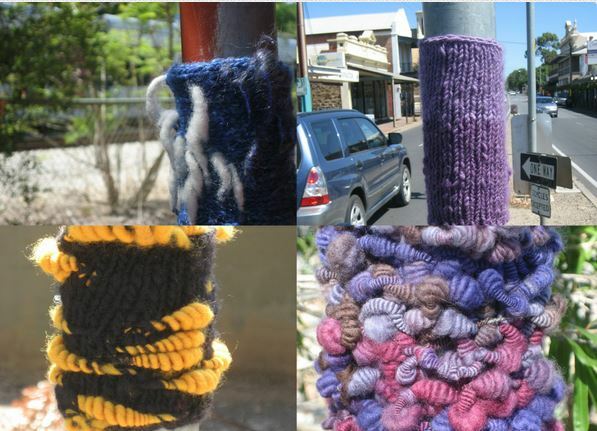 Yarn bombing is even more forgiving than teapots when it comes to the texture and qualities of the fibre concerned… and there is an argument for only using fibres that can’t be made into clothing or blankets for yarn bombing, I think. So in a burst of carding enthusiasm, I’ve been preparing batts. Carded and ready to spin. 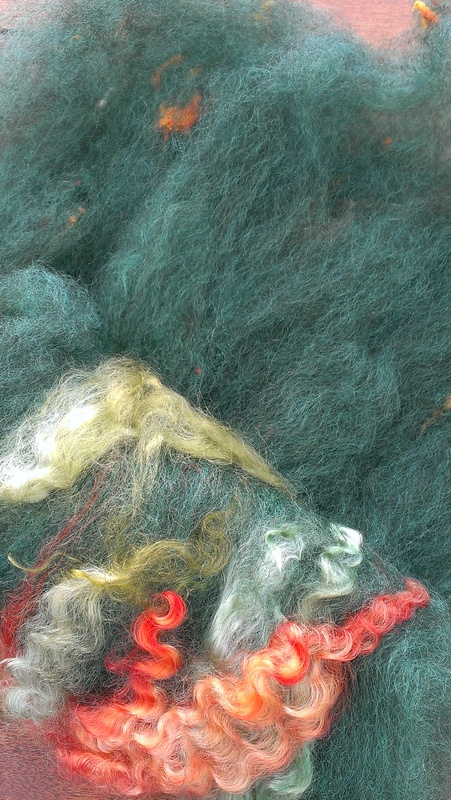 The felters also passed on this green fibre of unknown origin, which was improved very much by re-washing and carded out beautifully. 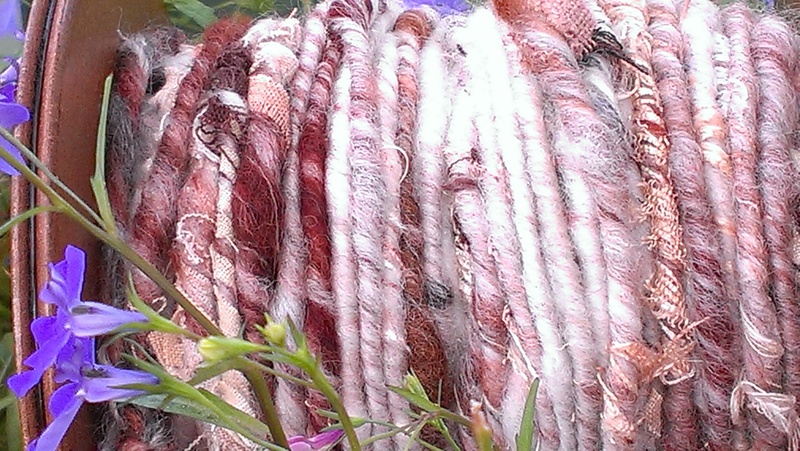 I have added dyed mohair locks and silk noil, and we’ll see if it can become a repectable art yarn. I’ll report back when I’ve tried turning these away from the waste stream and into something of use!